Edward Calvin Kendall , American biochemist and Nobel Prize winner, isolated the hormone thyroxin and played a leading role in the isolation and synthesis of the hormone cortisone. On March 8, 1886, E. C. Kendall was born in South Norwalk, Conn. 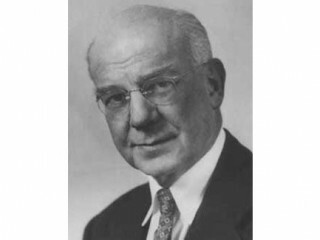 He received a bachelor of science degree in 1908, a master of science degree in 1909, and a doctorate in chemistry in 1910 from Columbia University. The following year Kendall was a research chemist with Parke, Davis and Company in Detroit, and from 1911 to 1914 he worked at New York City's St. Luke's Hospital. During these years he was engaged in research on the thyroid gland. In 1914 he succeeded in isolating the thyroid hormone thyroxin. His discovery was reported in the Journal of the American Medical Association for 1915. Also in that year, he married Rebecca Kennedy. In 1914 Kendall had accepted a position as head of the section of biochemistry at the Mayo Clinic Graduate School in Rochester, Minn., and in 1921 he was named professor of physiological chemistry. At the Mayo Clinic he and his coworkers made important scientific contributions, including studies on oxidation in the animal organism, but Kendall's most significant achievement was the isolation and synthesis of cortisone, a hormone produced by the adrenal cortex. The adrenal glands had been observed first in the 16th century, and by the 19th century it was suspected that the adrenals were related to certain diseases. In the 1930s several researchers began to study them in an effort to determine what the active substance of the glands was. This proved a very complex problem since the adrenal cortex alone produces a series of closely related hormones. Kendall's research team isolated several of these hormones, including one that was renamed cortisone in 1939. Kendall's early reports on the isolation of cortisone and other hormones of the adrenal cortex appeared in the Proceedings of the Mayo Clinic (1934) and the Journal of Biological Chemistry (1936). He then guided work toward the synthesis of cortisone, which was accomplished between 1946 and 1948. Kendall had a major role in the introduction of cortisone for treatment of rheumatoid arthritis and rheumatic fever, although Dr. Philip S. Hench of the Mayo Clinic directed the early testing. In 1950 Kendall and Hench shared the Nobel Prize in physiology or medicine with Tadeus Reichstein for their work on cortisone. Kendall retired from the Mayo Clinic in April 1951 and became visiting professor in the department of biochemistry at Princeton University. He died on May 4, 1972, in Princeton. View the full website biography of Edward Calvin Kendall.